Here's everything we know about the tiny console with a big videogame footprint. The Ouya may be vapor-hardware like the Phantom, it may completely shift the paradigm of the publisher-developer business model, or it may just be a nifty gadget. We won't know for sure which scenario is true for at least a few months, but we do the upstart Android console broke quite a few records. The Kickstarter campaign ended early this morning with the total funds raised equaling $8,596,475. 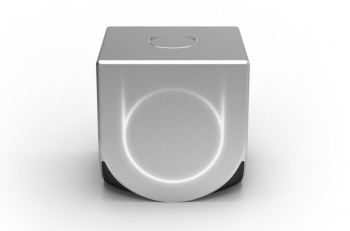 The goal for the project was $950,000; the Ouya now has more than 900% of its desired funding. There were 63,416 backers, with 59,748 donating at a rewards level in which they receive an Ouya. Skeptics will point out that a console which only sells 60k units ain't exactly a smashing success, but reaching 60k sales in only one month, with limited advertising at that, is a feat that can't be ignored. The campaign is not the most money raised on Kickstarter, that distinction goes to the Pebble watch with a programmable face which raised $10,266,846 earlier this year, but the Ouya is currently the second-highest grossing project on the crowdfunding website. The buzz for the Ouya grew quickly so that it raised $2,589,687.77 in the first 24 hours, breaking the Double Fine Adventure record of $1,064,652.05 raised in just one day. CEO of Ouya, Julie Uhrman, made several updates to allay concerns and promise an ample game library at the console's launch. Ouya brokered a deal with OnLive to stream bigger videogame titles through the service your HDTV. Square-Enix signed on to bring the Japanese Final Fantasy III to the Ouya at launch, which will be the first time American audiences will be able to play the game on a big screen without illegally importing it. Uhrman also said she's talking to many publishers about bringing some older games in the library to the Ouya, but she couldn't say which companies this early in negotiation. That is, except for Namco-Bandai, which released a statement explaining the company was interested in bringing classics like Pac-Man and Tekken to the Ouya. More technical details emerged over the course of the Kickstarter campaign. The little Android box will have a small form-factor, with designer Yves Behar promising a console no bigger than a Rubik's Cube. Up to four controllers will be supported on a single console, so get ready for some splitscreen multiplayer action. There was even a "limited edition" available for $140 with a nice brown plastic instead of the standard white. Ouya isn't just stopping at delivering games either. You'll be able to install Plex or XBMC to play media from your home library on your big HDTV using the HDMI connection. Finally, Uhrman wonders if the Ouya hardware wouldn't one day be embedded in a TV, eschewing wires entirely. There's a lot to digest regarding the Ouya, but don't be surprised if the startup goes on radio silence for a few weeks as they try to figure out the best way to spend $8.5 million. And hey, if you were still interested in dropping money on an Ouya but the Kickstarter ran out before pay day, well the company is accepting pre-orders now through PayPal. Take a look.